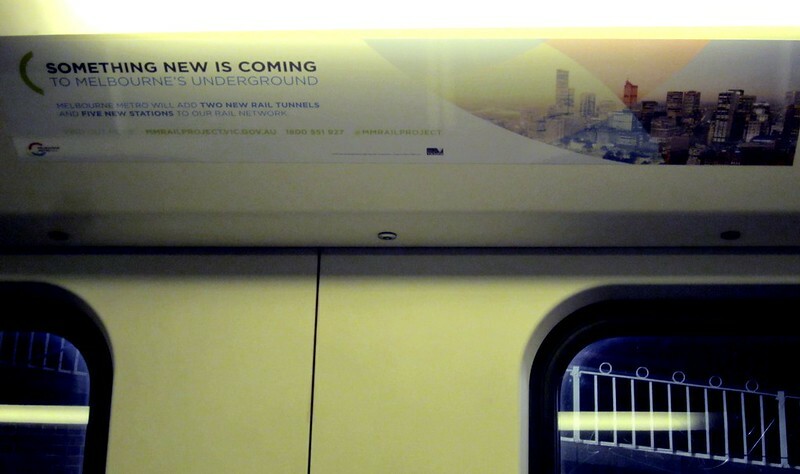 Remember the ads for future transport projects that we saw in 2010 and 2014? They’re baaaaaack. The metro rail tunnel isn’t fully funded. But the ads are a bit different from the ones we saw last year for the proposed (but now scrapped) Melbourne Rail Link (the Coalition’s then-alternative tunnel plan) and the airport rail link (on ice for now). Although not yet fully-funded, work on the metro rail tunnel project has actually started. 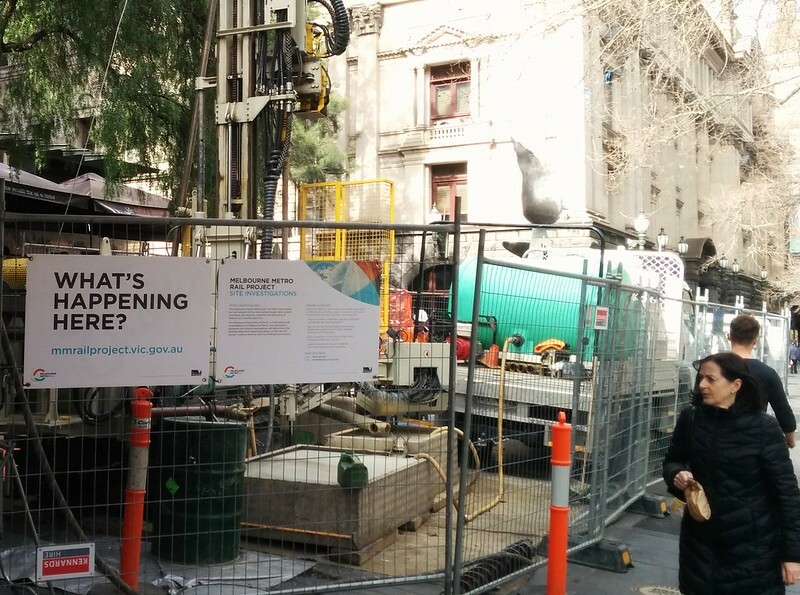 There has been test drilling along Swanston Street and elsewhere, as well as a lot of planning work. Labor is clearly pushing to have major construction started before the 2018 election. This isn’t unreasonable — unlike the Coalition’s East West Link, Labor went to the 2014 election promising it. And of course Labor would be hoping to use the sight of bulldozers and tunnel boring machines as a springboard to re-election. Hopefully this also locks in the project for completion, no matter who wins in 2018. Obviously they’ll be hoping for Federal funding. Tony Abbott’s Coalition is highly unlikely to provide any, but if leadership of the Coalition falls to someone else, and/or the Coalition is defeated at the next Federal election, funding is more likely. And if not? Well it’s a ten year project (by the time it’s finished, we’ll certainly need it), with a cost of about $10 billion. It would obviously be a lot of money, but $1 billion a year wouldn’t be beyond the capabilities of the state… though of course the tunnel will only really work well as part of a suite of train, tram and bus upgrades, for which funding is needed. And of course money is also needed for other projects (transport related and elsewhere). So is this round of ads as extravagant and ill-conceived as those from Labor in 2010 and the Coalition in 2014? I think not quite. These ads (from what I’ve seen so far) are lower-profile/cheaper, and not as directly/blatantly aimed at re-election. And at least they have a purpose: to inform of a project that is actually underway, point people towards the project web site, which in turn points people to the online survey. And of course, I’d encourage everyone to look at the survey and give them your views of the project! I guess at the very least it will get Melburnians ready for the disruption in the city over coming years. It’s unfortunate that the government and most commentators have embraced the Metro Rail Tunnel prematurely without adequately considering alternatives. As far as I’m aware there has never been an adequate cost-benefit analysis of this project which compares it with the alternatives. Please correct me if I’m wrong. The major goal is to achieve a significant increase in rail capacity through the inner area. The obvious alternative is the Northern-Caulfield loop connection, as described in the PTV’s 2012 Network Development Plan. [note 1] The Northern-Caulfield loop connection provides MORE capacity increase than the Metro Rail Tunnel, at a cost which must be many billions LESS. I don’t understand why it is being ignored. Metro Rail Tunnel: 18 track km of new tunnel and five new stations. Cost $9-11 billion. Northern-Caulfield loop connection: about 4km of new dive and tunnel for new chords from North Melbourne to Flagstaff and from Parliament to Richmond. No new stations. Cost? I’m not aware of any official estimate (that in itself shows how poor the assessment of alternatives to the MRT has been). But just from comparing the length of tunnel it would have to be less than a quarter of the MRT. Let’s say $2-3 billion. Both options provide a new track pair from the west by bypassing the present chokepoint where the Sunbury and Craigieburn lines merge to the northern loop. The Northern Caulfield loop connection also increases capacity to the east by removing the constraint of turning back Burnley relief line trains (Glen Waverley/Alamein) at Flinders St (these trains would continue to Sunbury). The Northern Caulfield loop connection also provides better through city cross-suburban connections than the MRT – all lines except the Clifton Hill lines would have interchange at either North Melbourne or Richmond or both. [note 3] This is important in light of future CBD fringe developments at Arden and Egate. $7 billion saved by prioritising the Northern-Caulfield loop connection over the Metro Rail Tunnel is LOT of money that could go towards many other important projects for Melbourne’s public transport future. Note 1: The 2012 Network Development Plan classed the Northern-Caulfield loop connection as a ‘stage 4’ project—that is, in the never-never. It made no attempt to explain this low priority. I can only guess that, because the government by then was already politically committed to the MRT, it wanted to avoid drawing attention to the existence of a more cost-effective alternative. Note 2: Things that would increase capacity on the Dandenong line, like longer trains or higher capacity signalling, are separate projects that could be done in either case and so are irrelevant to the comparison of options that I’m discussing here. Note 3: After the Northern-Caulfield loop connection the operating pattern would be: Werribee-Dandenong via Flinders St; Sunbury-Glen Waverley via Flinders St; Craigieburn-Frankston via Melbourne Central; plus Burnley loop, Clifton Hill loop and Sandringham as at present. A flyover west of Nth Melbourne could provide same direction cross-platform interchange between Sunbury-Flinders St and Craigieburn-Melbourne Central trains. To avoid conflict between Werribee-Dandenong trains and Melbourne Central-Frankston trains, city to Caulfield is converted to up-up-down-down running with a new flyover immediately south of Caulfield to take the down Frankston line over the Dandenong lines. This also provides very useful same direction cross-platform interchange at Richmond 3/4/5/6 between Frankston-Melbourne Central-Craigieburn trains and Dandenong-Flinders St-Werribee trains. Note 4: For example, continue replacing A & Z trams with longer trams. More use of the William St line. Build a short inner north cross-city line from North Melbourne station to Victoria Parade (as suggested by Melbourne City Council) to serve transfer trips from the western lines to East Melbourne. Serve the Arden development area with a new station between North Melbourne and Macaulay and a short tram extension from Queensberry St (this would be an alternative inner north terminus for some of the Swanston St trams which now terminate at Melbourne University). @John, remember also the metro rail tunnel offers the chance at urban renewal in the Arden area. Alongside better Parkville and Domain access, these non-capacity-related benefits are important to getting a project over the line. As for the Northern-Caulfield Loop connection idea, if it was done without the metro tunnel, then let’s assume the plan would be to connect the Dandenong, Frankston and Sandringham lines to the Sunbury, Craigieburn/Upfield and Werribee/Williamstown lines respectively (or some combination of them that can be done with zero flat junctions!). So operationally it could work, but from my understanding one of the reasons they’ve been hesitant is the impacts to train services during construction – supposedly it could involve closing Loop tunnels for up to two years to build the new connections. @John plus, that still won’t allow 9 car trains. MRT will be built with platforms 9 cars long. @Bramley: Another project, which I didn’t mention above so as not to complicate things, would be to run 9-car trains from Werribee to Dandenong via Flinders St direct. I guess the cost would be in the range of several hundred million: to extend platforms at 49 stations (Werribee/Williamstown to Pakenham/Cranbourne) with changes to track alignments or crossovers at about a quarter of these stations; significant work in confined spaces at Flinders Street and Southern Cross [note 1]; and conversion of City-Caulfield to up-up-down-down running with a new flyover at Caulfield (this is needed to avoid conflicting with Frankston-loop trains). But that’s still only a tiny fraction of $10 billion for the tunnel. And it gives the same capacity increase to Dandenong as long trains through the tunnel. I would argue that long trains from Werribee to Dandenong would have to be by far the most cost-effective significant capacity increase, and should be the top priority. The Northern-Caulfield loop connection would come next. After the Northern-Caulfield loop connection, if and when there was a need you could also run long trains from Sunbury to Glen Waverley. Again, the platform extensions are mostly straightforward. It would also be possible to run long trains from Sunbury instead of Werribee to Dandenong via Flinders St direct. In that case Werribee trains would go to Sandringham, as is proposed for after the Metro Rail Tunnel. Note 1. Extending platforms at Flinders St, Southern Cross, North Melbourne and Richmond would be complicated but is certainly doable. Elsewhere it is mostly straightforward. Note 2. Taking usual capacity as 20 per hour per track with existing signalling. Higher capacity signalling is a separate project which could be added to any of the options and so is irrelevant to a comparison of options. From the west: one new track pair plus 50 per cent capacity increase on both Werribee and Sunbury lines. 50 per cent capacity increase on the Dandenong line. There is also increased capacity to Glen Waverley, but I don’t stress that here because there’s no particular need for it—it’s just operationally simpler to treat Glen Waverley as the eastern terminus of the Sunbury line. Arden, Parkville, Domain… Love them—but the cost!! If you had $7 billion to spend on Melbourne public transport infrastructure, without constraints, would you really pick as your highest priority adding two new stations in places already well served by tram [note 1] and a third that’s just 500 metres from North Melbourne station? That’s effectively what you’re doing if you prefer the Metro Rail Tunnel to the Northern-Caulfield loop connection, for the sake of that extra benefit (the three stations) at that extra cost. AFAIK there has never been an adequately detailed, adequately costed study that considers costs, benefits *and alternatives*, to justify treating this project as the highest priority for major public transport investment. The whole thing came from nowhere in the 2008 Eddington East-West Needs study (it was never part of any overall Melbourne transport plan or public transport plan); grew political legs virtually by chance, at a time when a state Labor government happened to coincide with a public-transport-friendly Federal Labor government; and is now in the ‘motherhood’ space where everyone seems to think it must be good because everyone else seems to think so. That’s no sound basis for spending $10 billion. Note 1. And, I repeat, there are a number of options for improving those tram services, and beefing up public transport to the Arden development area, at a cost that would be tiny in comparison with the tunnel. @Daniel: Problem of the long shutdown of the loops that would be needed to build the Northern-Caulfield loop connection. Two years? This sounds suspiciously like spin from someone with a brief to talk down the Northern-Caulfield loop connection. In Bondi Junction, Sydney, a few years ago, a similar job of breaking a new tunnel into an existing one required a shutdown of a month (but I concede that the Melbourne geology is probably trickier). Suggestions below on how you would stage the project. Again, the underlying point is that we should have something more than ‘understanding’ and ‘supposing’ to justify $10 billion decisions. If I’m wrong, I’d like to see the adequately detailed comparison of options that shows it. 2. Inside the portal of the southern branch of the Caulfield loop at Richmond. During this shutdown all Frankston trains run to Flinders St direct. 3 & 4. On the Caulfield loop near Flagstaff and on the Northern loop near Parliament. During these shutdowns Craigieburn/Sunbury/Werribee trains run through to Dandenong/Frankston/Flinders St, using two track pairs on the Flinders St viaduct. During this shutdown, to serve the loop, you would temporarily reinstate the city circle train service on the Clifton Hill loop, which has spare capacity. You would provide extra tram services from Southern Cross to Latrobe St and from Flinders St to Parliament. Ideally you would have already built a short inner north cross-city tram line from North Melbourne to Victoria Parade (as suggested by Melbourne City Council). My main question is … given there are two new stations very close to two existing stations (Flinders St and Melbourne Central), why don’t we simply call it a “bigger” Flinders St, and a “bigger” Melbourne Central station. I’m fairly sure there’s a station or two in Singapore that is about 400m end-to-end (about 5min walk), and there’s a station in Osaka that’s a bit smaller, but not by much. The Osaka case is an intersection of three lines, and I think the Singapore case is as well. It should be a fairly simple matter to bore a tunnel from the new Eddingstation to some existing part of Melbourne Central (perhaps near the northern end almost under Swanston St, where the old stairs used to be), as a continuation of the paid area. Connecting to the existing Flinders St Station is a bit trickier, but connecting into the Degraves St subway is possible, if pedestrian congestion could be managed. Of course, both Eddingstations will also need their own connections to the street(s). Thanks. It takes a fair bit to digest. Melbourne Central/CBD North: Connection not really shown on the map, but the words seem to say the passageway will go under Latrobe St, west of the Swanston St intersection, into the northern edge of the concourse. Seems reasonable, perhaps with a minor tweak to give direct access to both the paid area concourse and the unpaid shopping area directly above it, with a row of gates between the passageway and the unpaid area. Flinders St/CBD South: Maps show going under Flinders St, west of the Swanston St intersection, then escalators going up two stories up to the concourse. Seems a bit torturous. I would have thought a better connection could be had into the Degraves St subway, and possibly the Elizabeth St subway. Or build a new subway/expand the Degraves St subway. The Flinders St plans as shown would cause congestion on the concourse, given that the concourse is already a high-traffic area.